These technical requirements relate to Jim2 Business Engine on premises version. Please see Jim2.Cloud Technical Requirements for the cloud version of the technical requirements..
Jim2 Server requires Microsoft .NET 4 Framework Version 4.6.2 or above to be installed. The updater will check and confirm that it is installed, or will prompt you to install it. Jim2 also supports SQL 2017. ▪Microsoft SQL Server 2012 R2 or later (SQL Server 2017 recommended). ▪SQL mirroring is not supported. Depending on the size of your organisation, it is recommended to run Jim2 on a standalone server. Jim2 and SQL should not be installed on a computer where users are accessing it to work, ie. user desktop or terminal server. Both performance issues and security threats will be increased. Windows Powershell version 5.1 is a requirement if powershell scripting is to be used. Refer to https://docs.microsoft.com/en-us/powershell/scripting/setup/installing-windows-powershell?view=powershell-5.1 (copy and paste into a web browser) for more information. ▪Windows 8, 8.1 or Windows 10 (Windows 10 is recommended). ▪Microsoft .NET 4.6.2 or greater. Jim2 eBusiness Framework requires Microsoft .NET 4.6 Framework to be installed. To ensure a quality Jim2 Business Engine experience, reliable high speed internet access is required. A stable network is required by Jim2. Any network issues will be quickly revealed when using the software. The network should be configured and tested prior to loading Jim2. Every workstation which will view or print reports, invoices etc. will require a working installation of a printer. These can be installed through the windows network/local printers system. 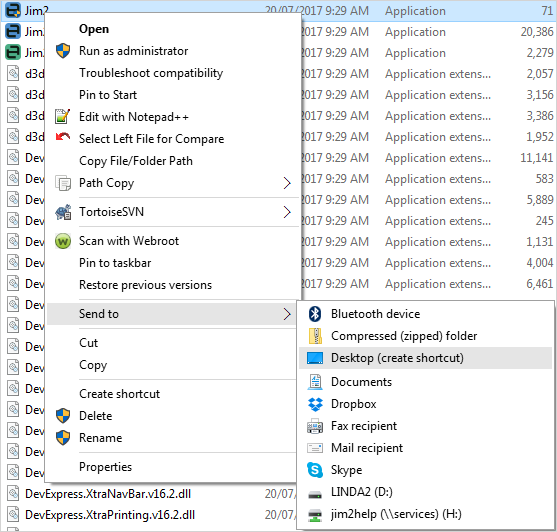 It is recommended that every workstation has access to a printer (shared through network or locally installed), as a printer is required to both generate and preview reports from Jim2. You can add the printers in Jim2 via Tools > Options > Other > Printers. ▪Zebra GK420/430 series thermal or direct USB transfer label printer (4 inch) with EPL drivers. ▪Label – 40mm x 28mm. Whilst the thermal transfer printer printer can be used in direct thermal mode (ie. no need for ribbons), this process fades over time when exposed to light. Citizen CTS-651 80mm Thermal Receipt Printer (USB interface). This process fades over time when exposed to light. If you don’t have a receipt printer, you will require a generic USB cash drawer trigger to open the cash drawer. Any generic hand-held scanner should work with Jim2. Most are plug and play. If you wish to use the supplied SQL Server (2016 Express) software to drive your Jim2, please contact Happen Business (sales@happen.biz) if you have not received an email link. Alternatively, you can use the full version of Microsoft SQL Server. This must be fully installed before the Jim2 install. SQL Server Management Studio is also required. SQL Express is generally adequate for new sites but does have limitations. For larger sites (10-plus users) SQL Standard may provide better performance, and allows for databases larger than 10GB. Jim2 Server requires the SQL Server database software to be installed (see above). To install Jim2, please contact Happen Business (sales@happen.biz) if you have not received an email link. This step will install a Jim2 folder (directory) on the server. Jim2 Server must be installed on the same server that has SQL installed. We recommend that the Jim2 directory on the server is shared, and a shortcut to Jim2 in the shared folder be installed on the workstations. This minimises the time required to install updates to Jim2, as all files are centrally located. It also avoids problems with version mismatches. Right click on the Jim2 directory and select the Share option to share the folder. To install a shortcut, browse to the shared folder created above. Right click on the Jim2.exe file and click Copy. Move back to the desktop and right click to paste the shortcut. This will create a shortcut file to the Jim2 client. Alternatively, right click on the Jim2.exe file and click Send to Desktop. Happen Business will supply you with a unique licence key file. This will be delivered as an attachment by email, and will need to be loaded to the server using the Jim2 Server Console. Instructions are included in the email. Settings which are workstation dependent (ie. printers, tills, fast invoicing, etc.) should be set on each workstation. 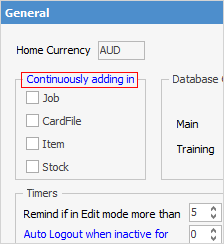 If a Happen Business Analyst configures the options and settings on a workstation, you should use these settings as a guide for the other workstations. All workstations should be ready to print within the network. Workstation settings under Tools > Options show as blue type. Black type indicates global settings. Happen Business releases free updates and new versions to Jim2 throughout the year. These updates include enhancements, bug fixes and new features. Please ensure that you keep Happen Business up to date regarding your email contact details, as notification of these updates is sent via email. To install these updates, you must download the update file and run it from your Jim2 Server machine. Follow the prompts to install the Jim2 update. We recommend that you become familiar with the Backup and Restore features of Jim2. We recommend that you back up your Jim2 database on a daily basis using the Scheduled Backup feature in Jim2 Server. Please consult your IT manager on the best solution for your backup requirements.